The Sunshine State is entering spring—and the number of children who will spend time in the water will jump astronomically. Good times will be had by all. But when summer fun turns into a backyard drowning, the long-term devastation cannot be avoided. If you lose a loved one to a drowning accident, compassionate legal guidance will be essential. Of all the unintended causes of death for children, drowning is the second most frequently occurring in America, following only automobile collisions. In Florida, however, it is the number one cause of accidental deaths. The fact is, roughly 250-350 youngsters under the age of 5 die every year in this nation, mostly during June, July and August. 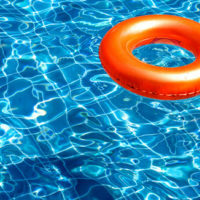 Moreover, 2,700 emergency room visits occur due to near-drownings. Sadly, the majority of these accidents occur in backyard pools. At the time of the accident, most children were under the supervision of one or both parents, and nearly 70 percent were occupied somewhere other than the pool. Little ones managed to get into the water before parents realized they were missing. 65 percent of accidents occurred in the child’s own back yard, with another third occurring in the yards of friends or relatives. More than three-fourths of victims had been out of sight for less than five minutes when the accident occurred. Place barriers around the pool or spa. Walls or fences should encircle the pool entirely, and should be at least 4 feet high. Gates must be self-closing with automatic latches. One not so obvious tip: keep furniture that can be used to climb over the fence away from the area. Invest in a motor-powered safety cover for the pool when it is not in use. Avoid keeping pool toys or floaties that may be tempting to youngsters in or around the pool. If it is an above-ground pool, remove steps and ladders from the pool when not in use, or at least lock and secure them. Pool alarms that meet ASTM requirement standards can be heard both indoors and out. They are a wise investment. Make sure a qualified professional properly inspects drains. Suction fittings and covers should be the right size and meet modern safety standards. The lack of oxygen in a near-drowning accident may have significant impact on the brain, lungs, and kidneys. It can result in neurological deficits of prolonged length. Clearly, time is a significant factor in determining the effects. Dealing with the emotional stress following a catastrophic pool incident can be overwhelming. That is precisely why you want the compassionate, yet effective personal injury law team at the Law Offices of Robert W. Elton in Daytona & Ormond Beach to help you with the legal aspects of the accident. Contact us today for a free, confidential consultation.